A website dedicated to the vintage and old school stereos of the 1980's and 1990's. Look for in depth reviews of amplifiers, speakers, subwoofers and more. Depending on feedback, I may post new designs occasionally. The design show above is our most popular design, choose between 4 colors and several sizes. Each shirt purchase helps support OSS / Williston Audio Labs and allows us to continue offering unbiased reviews. Thanks as always for supporting OSS. Don't forget to subscribe to our YouTube.com/BigDWiz channel so you can keep up to date on our latest audio test! Please check out each of these channels and make sure you subscribe and tell them BigD sent ya! Datatech2000 is a channel displaying mostly car audio head units. Dan runs the channel and shows off everything from early 80's Pioneer head units, to highly desirable Nakamichi tape decks and early 90's Alpine CD tuners. Dan also repaired my Sony CDX-R77 that would not play CD's. Great technician as well! Ryan Blankenship's channel focuses on car audio amplifier tests and what he calls "Budget Gem or Budget Bust". He unboxes the amps, then tests, then talks about the results. Barevids is a UK based channel displaying mostly videos about amplifier repairs. I find the videos fascinating and think you will enjoy them as well! Make sure you are subscribed to my channel so you'll receive notifications when I upload the next exciting video! Thanks for your support and remember to keep it Old School! Support OSS - Williston Audio Labs and get extras! OSS and Williston Audio Video Updates! Again, there are MANY more new videos listed in alphabetical order on the Video Section of this website, don't forget to check that page and keep it bookmarked. Support OSS and get extras! 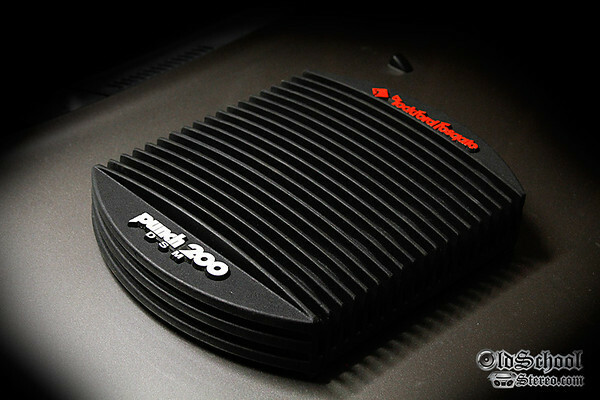 The Power 1000c or Power 1000 MOSFET was Rockford Fosgate's top of the line amplifier offering from approx. 1990-1994. Earlier models of the 1000 were available in black or custom colors via the Perfect Interface division. The 1000c is one beautiful amplifier! It's retail cost was $2699 USD and was rated to deliver 150x4 at 4 ohms or 500x2 at 4 ohms. See previous videos where we've discussed this amplifier more in detail. Sorry guys, it's been a minute since I've updated the OSS website. I spend most of my "free time" editing videos and sharing cool pics on Instagram. OSS has grown quite a bit in the last year and we are now over 22,000 YouTube subscribers, 12,500 Instagram followers, and 5000 plus likes on Facebook. You may have noticed I have also tested more new amplifiers. I feel this is important and I will include as much historical information on the company as possible. My BigDWiz YouTube channel will continue to show OSS content as well as other audio, video, photography and technology related videos. Consider the Old School Stereo component will be a "show" on the BigDWiz channel. We put a lot of time and effort into our videos and feel adding newer technology as well to the channel will help us grow, and also introduce people to the vintage gear. Thank you as always for supporting OSS, see the updated video list in the Video Section of our website. I've posted a few of the more popular recent videos below. More coming soon! Make sure you are subscribed on the BigDWiz YouTube channel for updates when new videos are released. 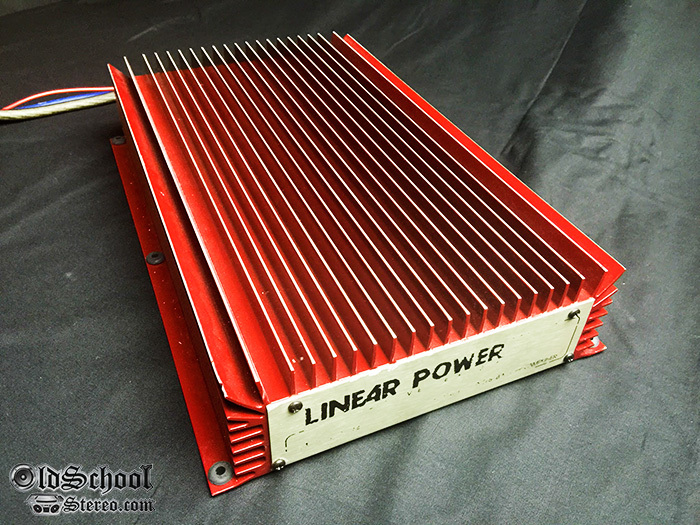 The Linear Power 8002 was an 800 Watt single channel amplifier optimized for 8 and 4 ohm loads. It was available from 1991-1997 and sold at a MSRP of $1599. Unlike most of the mono amplifiers of today, this 8002 is capable of reproducing the entire 20Hz - 20kHz frequency range. We initially ran all of the tests using the 4 ohm power supply taps, which lowered rail voltage and increased current. Amp is less efficient in this mode and also produced less power. After a call with Linear Power, it was suggested I set the amp to the 8 ohm taps to run the 8 and 4 ohm Dyno tests. If you read the original Linear Power manual, they caution against running the amp in 8 ohm mode powering 4 ohm speakers. It is quite evident these amps are overbuilt and are more than capable of handling the additional load without breaking a sweat! The Linear Power 8002 was also in a battle of "monster" amplifiers in the October 1991 Car Audio & Electronics magazine. Other challengers were the Rockford Fosgate Power 1000 Mosfet, Precision Power 2350DM, Orion GS500 and HiFonics Colossus VII...quite a group of large, powerful, Class AB amplifiers! Since the 8002SW is a mono amplifier, the tester used 2 of these amps in the comparison. It may or may not surprise you, but the Linear Power came out on top. Quite an impressive feat, considering the competition! 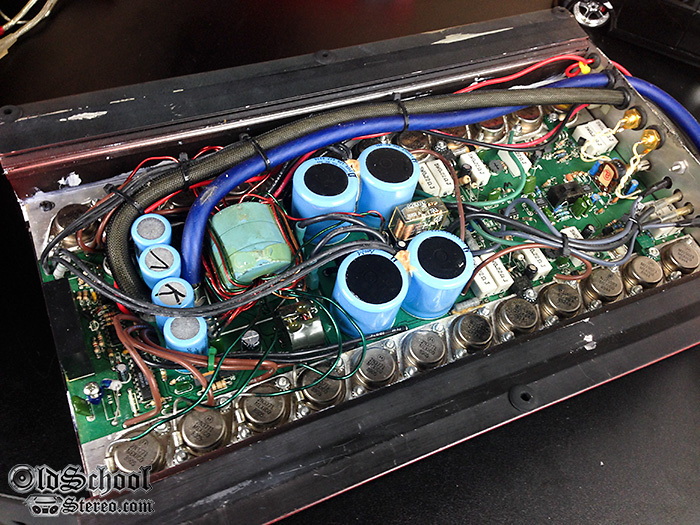 Watch the video and see the results obtained from this 20yr old car audio amplifier. Nothing short of spectacular! All tests above were at 40Hz. As you can see by the results, this amp is well suited for subwoofers or mid-basses as it has a nice amount of dynamic headroom for those transient peaks. More Amp Dyno AD-1 tests coming! 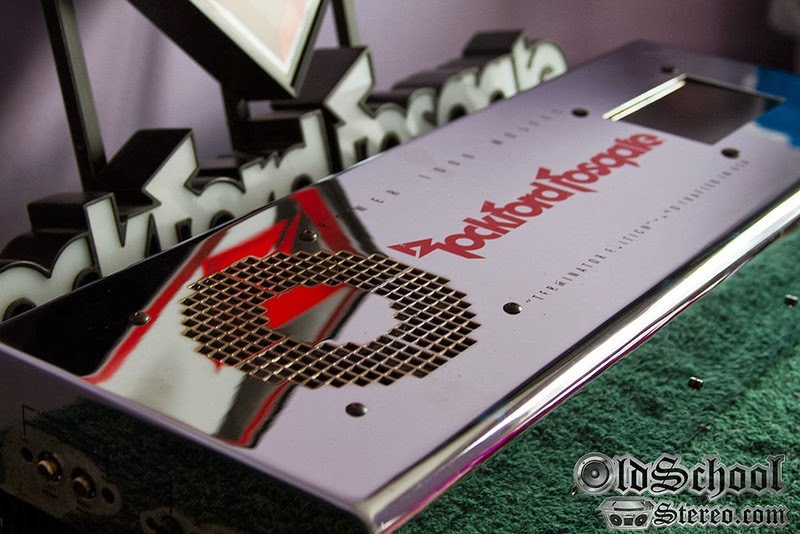 Those who know car audio from the 80's and 90's know the Rockford Fosgate Power 1000 Mosfet. A beast of a four-channel amp, costing close to $3000. The model shown above is a later generation "Terminator Edition". First gen models were 6" longer with a caboose to help hide the wiring and they also had no LED meter like the later "Terminator Edition" and 1000c models. Understand, not all chrome Power 1000's with LED's are Terminator Editions. Internally, they appear to be the same amp, yet Rockford Fosgate gave appreciation to Wayne Harris' design of the shortened 1000 with the LED meters and made a limited run of Terminator Editions. Read the earlier article about this amp here. 1993 Rockford Fosgate 200 DSM vs SMD AD-1 Amp Dyno - Impressive! We knew based on the previous tests of the Punch 200 this amp was powerful and dynamic, however we were unaware of the hidden "dynamic power" within this amp. Back in 1993, this amplifier retailed for around $600 US and replaced a legend, the Punch 150HD. It was no small feat for Rockford engineers to create a superior amp to the tried and true Punch 150, but trust me...they were successful! All tests above were at 40Hz. We re-ran the tests at 1kHz and the only notable differentiation in results was the 2 ohms Dynamic RMS test where we obtained 920W at 12.79V. We have determined the difference was related to voltage and believe provided the proper voltage (14.4V), the amp would have measured over 1000W Dynamic RMS at 40Hz also. Not bad from a 200W amp! 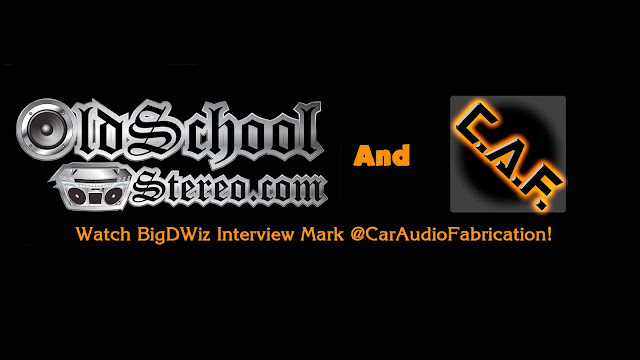 Watch BigDWiz interview Mark @ CarAudioFabrication! Check out this detailed interview of the man behind CarAudioFabrication! The video is over an hour and a half chocked full of interesting content and insight behind the man who tells the "secrets" of car audio. Be sure to check the information below the embedded video...you'll be able to jump to a specific question in the interview. I wish everyone would, but doubt most people will watch the entire 1 hr and 38 minute interview, so to make it easier, I added links to the exact point of the video for each question I asked Mark. We discuss everything from where to buy fiberglass material to what we think about Steve Meade's success! I had a great time interviewing Mark and think you guys will enjoy watching the archive. 1) Who or what got you started into car audio? 2) Describe your first system? Learn Electronics at D'Amore University! 4) What was your first "real" system? 5) Any favorite amp from years past? 6) How much power are you running in your current system? 7) Any particular favorite sub you've used? 8) What type of subwoofer enclosure do you prefer? 9) How long have you been fabricating? Who was your inspiration? 10) What kind of music do you listen to? 11) What do you want to improve upon and learn more about in the future? 1) Why did you start a YouTube channel? 2) What's the secret of your channel growing so fast? 3) What do you think about Steve Meade's success on YouTube? 4) Have you ever considered joining a network on YouTube? 5) What's your goal with your YouTube Channel? 6) How much time do you invest in your average YouTube Video? 7) What misconceptions are there about your channel? 8) What's the biggest challenge in making YouTube videos? 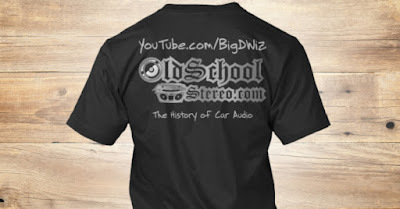 1) How old were you when you started in car audio? 3) What is your day job? 4) How do you determine how much to charge for custom work? 5) If you were asked to make a SEMA car, would you? 6) How do I donate to your channel / website? 7) What are your thoughts on MECP? 8) What's your worst experience while installing? 9) How did you solve a difficult challenge using an outside the box solution? 10) What brand of router bits do you use? Alpine 7288 Cassette Radio/CD Changer Controller - Vintage, Old School! Content (c) 2010 - BigDWiz. Powered by Blogger.